A couple of decades ago, there was hardly any info available about BADAGA – both people and language. Now, On ‘Google’ when ‘badaga’ is typed, what comes out as information is mind boggling. Of course, on a deeper analysis, whatever is listed is NOT completely BADAGA. That apart, there are many websites, blogs and discussions and [YouTube] Videos that can make you cringe. There are plenty of ‘cut and paste’ jobs or more regrettably plain copy posts. As you can guess, no credit to the original ‘creators’ given by these copy cats. Worst, there are many videos in the name of ‘Badaga Dance’ that are downright amateurish, ‘cheap’ and and not Badaga dance at all. But then, there is plenty of ‘good’ information if you really prepared to spend some time to ‘see what you want – Look beyond what you see! 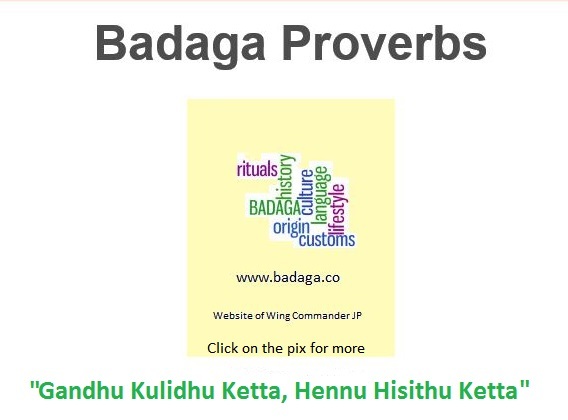 The biggest satisfaction is that there is interest among youngsters to know all about Badagas…the history, origin, traditions, customs and culture. Attempts are being made to ‘create a written script’ for Badaga by Anand and others. Badagas themselves are carrying out research to learn about our past history and record them in their books. J.B.Balasubramaniam is about to bring out a second edition of ‘PAAME’ a highly laudable effort. ‘Badaga Samuthayam’ by Sivaji Raman [of Jakkanarai] is a treasure trove. Badagas spread all over the world are bringing laurels to Badaga Community with their pioneering work. Vinitha Rajkumar in UK is running a successful ‘Bharatanatyam’ school.Students like Sumathi Halan, who is doing her higher studies in Canada, is a source of information on India in the local community. Both Vinitha and sumathi are invited to give speeches in the town hall meetings. Melur Village, a small Badaga hatti, is a ‘smoke free’ hamlet. BMW is not about the high end car or ‘Behen Maya Wati’ but’ Blue Mountain Warriers’ consisting of Badagas who are concerned about the environment degradation in the Nilgiris and doing their bit to help out the society. The slogan ‘Proud to be a Badaga’ coined by yours truly has become an universal cry of all Badagas. 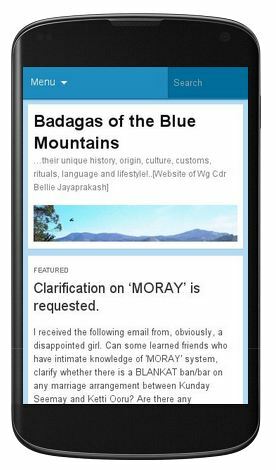 What started as a hobby but now a passion, this website ‘Badagas of the Blue Mountains’ has become a reference point to many. More than 100 visitors every day. That gives motivation to do more. ‘Proud to be an Indian and Proud to be a Badaga‘. (to my mom who left this world on 13 -7-2011:- without you or your inspiration, I am nothing. You gave me everything and always blessed me with – ‘ollithay agili’.